It is late Tuesday afternoon and pouring down rain outside. I have a fresh cup of tea by my side and a cheesy ham and potato soup in the crockpot. My husband is sitting on the couch reading the news and feeling a little bored which I view as a good sign. Boredom is an indication he is getting better. My daughter is home from school with a cold and she has dragged her brother downstairs to play video games with her. Not all of that sounds good--the cold, my husband's accident-but somehow it is all contributing to a peaceful afternoon. I have to go out again later but for now, I am just going to revel in the peace and quiet. I am currently reading The G.I. 's: The Americans in Britain, 1942-1945 by Norman Longmate. I have an ongoing interest in life during WWII. Most of the books I have read have been about life on the Home Front in Britain. This is a fascinating account of the arrival of the Americans in Britain and how the two countries reacted to one another. Two million American soldiers were stationed in Britain during the war and the two countries learned a lot from each other. I find the differences in the cultures absolutely fascinating. 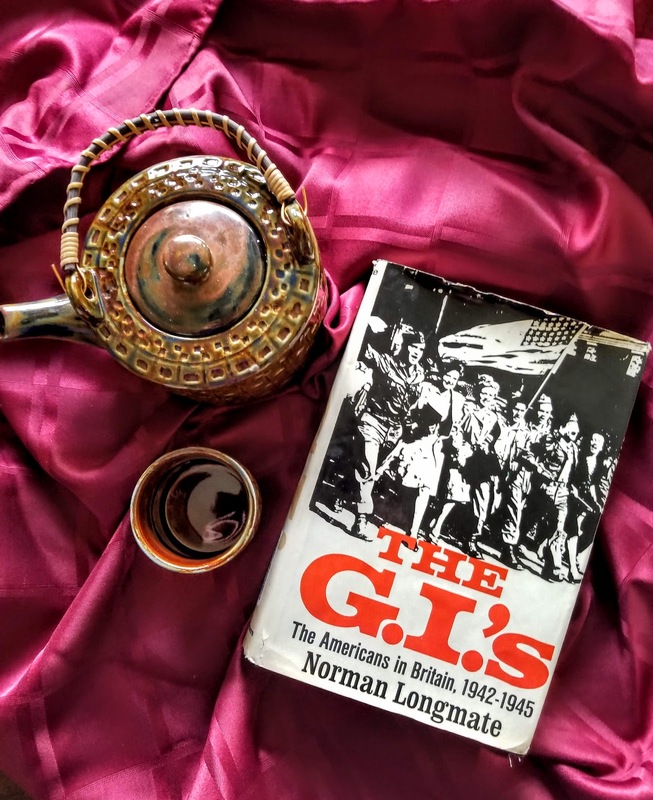 The book is full of reminiscences and first-hand accounts from the G.I. 's and the British people who encountered them. I am about halfway through it right now and highly recommend it. I have also read How We Lived Then by Longmate which is just as interesting. I ordered a couple of books at the beginning of the month, I always do, and I just got a notification that one book is no longer available and my money is being refunded. Obviously, that means I need to buy another book to replace it. At least books are cheaper than the perfect wool dress coat for under $200.00 that I am currently looking for. It can't be black, it needs to be knee length, and it has to look modern and fun while still being classic. I don't ask too much, do I? Maybe I should just go back to buying books. Isn't the teapot in the photo pretty? A friend showed up with a gift bag full of goodies for me--the teapot and cups, chocolate, cocoa mix, cookies, tea, and an entire flourless chocolate cake. She said she knew my husband was the one who was hurt but she thought I needed some comfort too. It was so sweet of her. I did share the cake with my family but the chocolate bar I hid away and I don't intend to share it though I should probably eat it soon before someone finds my hiding place. We might get snow on Thursday. Maybe it will be another afternoon of books, tea, chocolate, and soup. I wouldn't mind that at all. She/he sounds like a perfect friend, that was a survival kit! Yes there were/are quite a lot of cultural differences between the UK and USA. The GI's were given a guide book of how to behave and I've read a few novels which highlight the differences. I think Nevil Shute and Daphne du Maurier wrote about them. There were big problems with the way the black GI's were treated as second class citizens and that didn't go down well with the locals who had been given so much help from them. It's such a good sign that your husband is getting bored! I finished the book yesterday and found it so interesting. You mentioned Shute and du Maurier. Do you remember which books of theirs specifically deal with cultural differences? I feel like I might need to read more about this. And yes, boredom is a very good sign even if it is a little wearing for all! The Shute novel is called The Chequer Board,https://piningforthewest.co.uk/2016/07/04/the-chequer-board-by-nevil-shute/ a really good read I think. The du Maurier is called Rule Britannia and is set in 1970s Britain which has broken links with the rest of Europe (ooerr!) and the US have more or less taken over. This book I think shows that the author must have really disliked having the American GI's in her beloved Cornwall during WW2. I think I read the Du Maurier some years ago but I don't remember much about it. It is up in my attic somewhere. I'll brave the mess up there and find it! What a wonderful thing for your friend to do for you! I'm also looking for a warm knee-length winter coat for a reasonable price. Scarce on the ground. I think the length is what narrows the field so much. I wish you every success in your search. I think you are right. It is the knee-length that is causing the problem. They all seem to be hip-length and that is not what I want. I think it might be a long-term quest. I hope you find what you are looking for.